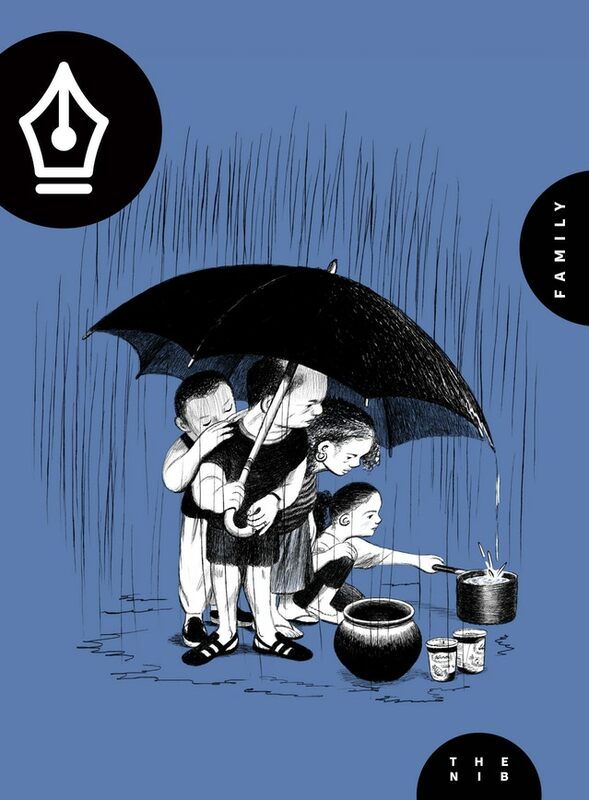 I reviewed the first issue of The Nib here, and there I wrote, "The contents of this magazine are first rate, well drawn, thoughtfully composed, and diverse in terms of scope and tone. This magazine offers much food for thought as well as entertainment, and I hope that it runs for a long, long time." Reading this second issue, I echo thoughts thoughts and wishes. This anthology continues to be excellent, full of entertaining and thought provoking works. 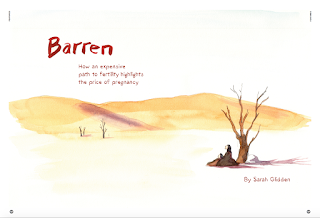 Sarah Glidden speaking about her struggles with fertility. 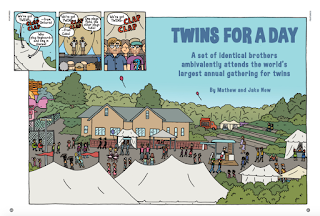 Twin comics creators Matthew and Jake New reporting about a twins festival they attended in Twinsburg, Ohio. 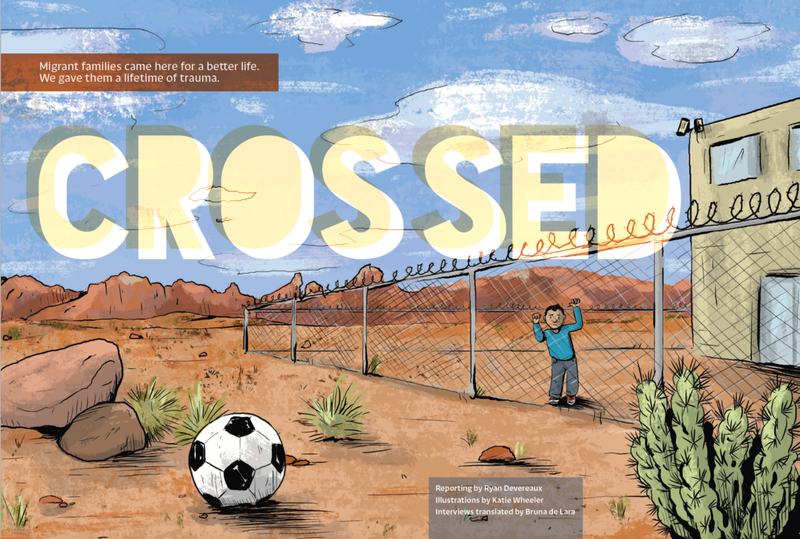 The Intercept's Ryan Devereaux reporting on a Brazilian father and son who were separated at the US border, illustrated by Katie Wheeler. And an interview with Fun Home's Alison Bechdel about the aftermath of writing an autobiography. There are many more interesting pieces in this magazine, which runs about 120 pages and is more like anthology book. Some are shorter one-pagers, gag strips, or even one panel comics, but they are all quality reading. 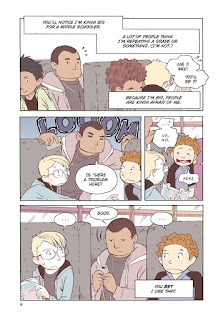 The Nib #2 was published by First Look Media, and they offer more info about it here. The Nib publishes multiple comics pretty much everyday, and the web version is available here. Future print issues of the magazine can be purchased here by becoming a member of the Inkwell Society. They plan to continue publishing on a quarterly schedule. This is the 11th entry in the Olympians series, and I have reviewed every single one of them. Next year will bring the series to a conclusion (with the book focused on Dionysus), but I will stave off my future sadness with this volume. It was a wonderful read, keeping up with the high quality of the entire series. 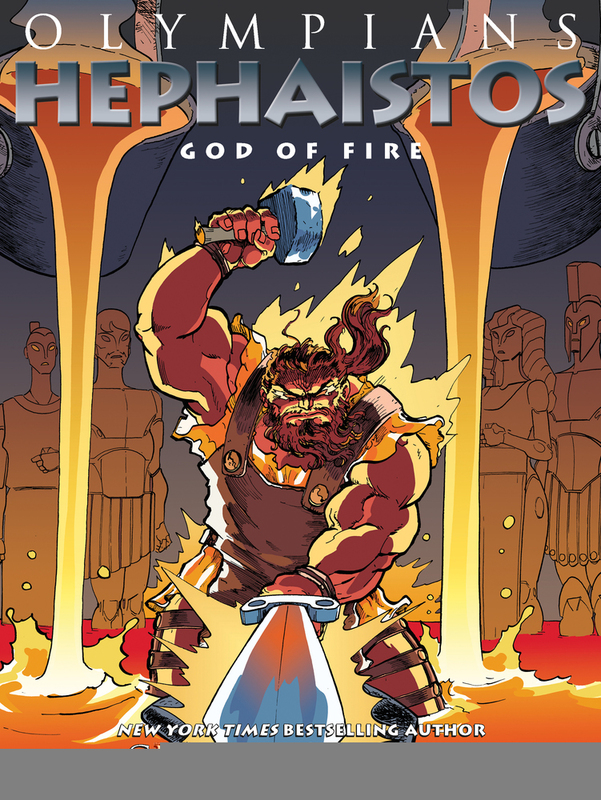 Hephaistos: God of Fire mostly focuses on the eponymous god, but his tale is mingled with that of the Titan Prometheus. The Titan was present as midwife for the god's birth and was witness to Hera's casting him out of Olympus. As he grew up, raised on the island of Lemnos, he became quite adept at craftwork, building increasingly intricate and gorgeous objects. He used these objects to gain entrance back into Olympus. There, he eventually married Aphrodite and became embroiled in the tricky politics and family dynamics of the Olympians. Fire figures in highly in this book, in that it is what powers Hephaistos's forge, and it is also a gift that Zeus takes away from humanity. When Prometheus steals fire and gives it back to humans, he is punished in two ways. First his family is visited with a misfortune that results in Pandora releasing a multitude of evils on Earth. Second, Prometheus is chained to a rock where an eagle comes and eats his liver each day. Hephaistos forging those bounds and speaking to the Titan become the narrative frame for the entire book. Like other books in this series, Hephaistos reflects and displays the title character's personality well within its pages. He is crafty, complex, and not simply shown to be some hideous creature. The artwork and narrative work together seamlessly (like Hephaistos's adamantine net), and I feel this book is a highly compelling tale that would appeal to fans of mythology or just those who are into good action stories. 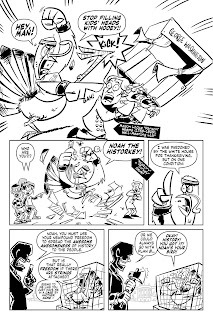 In addition to the numerous entries in the Olympians series, artist/writer George O'Connor has created the American history journal account Journey into Mohawk Country and the dystopian future book Ball Peen Hammer, written by Adam Rapp. 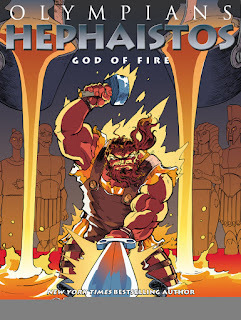 Hephaistos: God of Fire was published by First Second, and they offer a preview and more here. 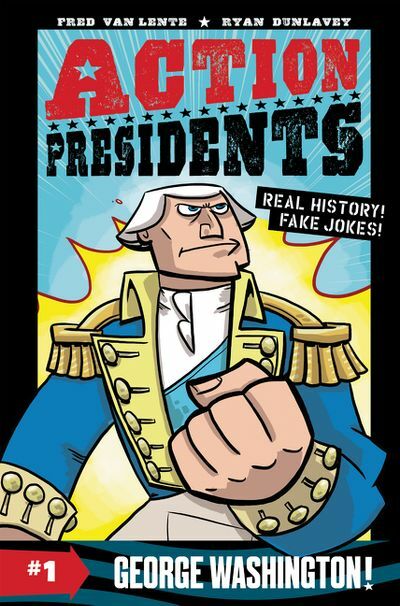 Action Presidents is a nonfiction series aimed at upper elementary/middle school students. They are quite detailed and nuanced, pretty substantial texts that contain lots of information and insight into some prominent historical figures. George Washington and Abraham Lincoln have been the subjects of a myriad of biographies, and these books contain much of the relevant details about their lives, from their childhoods to their deaths, but what is most impressive to me about this series is how it also introduces counter-narratives into the proceedings. 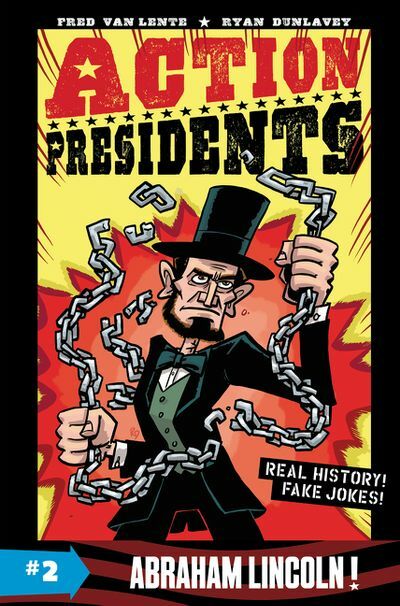 It would be easy to simply present these books as pieces of hero worship, and certainly they do not skimp on celebrating the various accomplishments of both presidents. George Washington is praised for all he did to establish the United States, but also running throughout Book 1 are his ambiguous views and actions regarding slavery, a theme that also colors Book 2. Washington kept and profited from slaves, and only freed some at his death, and Abraham Lincoln himself did not so much oppose slavery as he opposed anything that would splinter the country. He is lauded for the lengths he went to preserve the Union, but his own contested views are not sugar-coated or glossed over. I loved how these books presented both, warts and all. Not only do these books present distinct portraits of both men, it also situates their lives and actions in historical and governmental contexts. They are great resources for learning about the US government, policies, and laws, and I was very impressed by how many of the social studies they entailed. Also, there is also a good dose of humor throughout the volumes, embodied by the narrator, a pardoned turkey named Noah, and not a few fart jokes. Sometimes those instances felt a little like "sugar to make the medicine go down," but overall I feel the tone and content of these books was spot-on. I heartily recommend either (better, both!) volume to any class library. These books are the product of the dynamic duo of Fred Van Lente and Ryan Dunlavey. Both have numerous comics credits for multiple publishers, and they have collaborated on two prior historical comics projects, Action Philosophers! 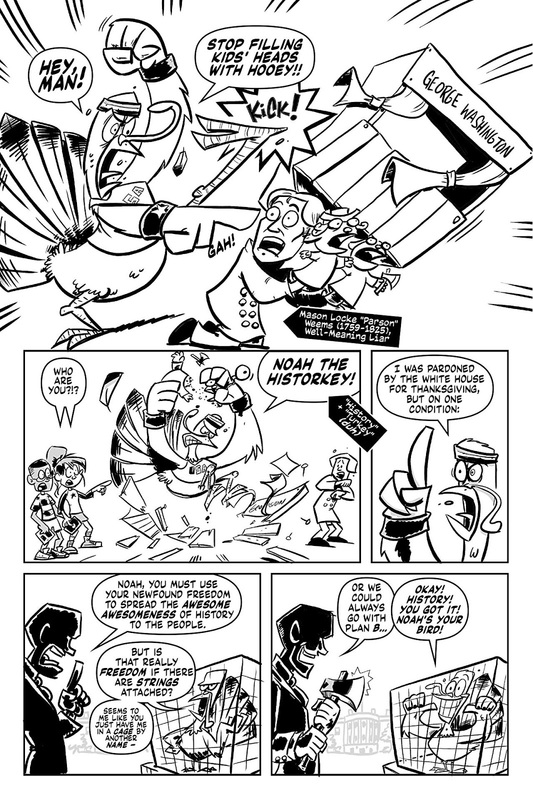 and The Comic Book History of Comics.This interview sheds more light on the Action Presidents books and series. The reviews I have read of these books have been positive. Johanna Draper Carlson applauded both for their "blend of action, humor, and meaningful points." 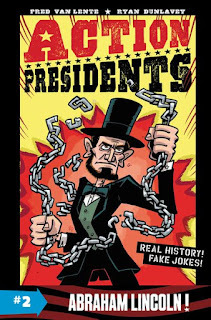 Publishers Weekly wrote of Book 1, "Van Lente aims to contextualize historical figures who are often blindly lionized..., a goal that comes through clearly amid a flurry of gags and jokes." Kirkus Reviews summed up, "A light, comical approach to biography and history that makes it more palatable for those who find more traditional approaches hard to swallow," and added that the book contains maps, timeline, glossary, and a bibliography. 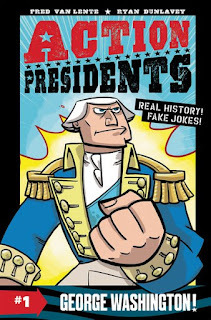 The Action Presidents series was published by Harper, and they offer a preview and more here. More books in the series have been proposed, and the next (announced at the end of Book 2) will be about Theodore Roosevelt. The fourth should be about JFK. The publisher provided review copies. 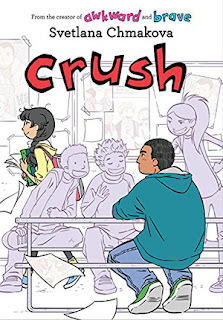 Crush is the follow-up to Brave, and I loved it for a few reasons. First, it features relatable situations and vivid characters. The protagonist here is Jorge, a large young man who is good at basketball and acts as a sort of guardian for a bunch of kids at school. He frequently uses his size as a peacekeeper, stopping bullies from harassing others. For his efforts, he receives grudging respect from members of the football team. However, the star quarterback secretly goads classmates to harass and tease others, all the while giving respect to Jorge and calling him "sheriff." Jorge recognizes what's going on to some extent, and he wants nothing to do with those kids. Still, he finds that this rejection comes with consequences, as they find a way to bully him that has some pretty drastic results for his reputation. 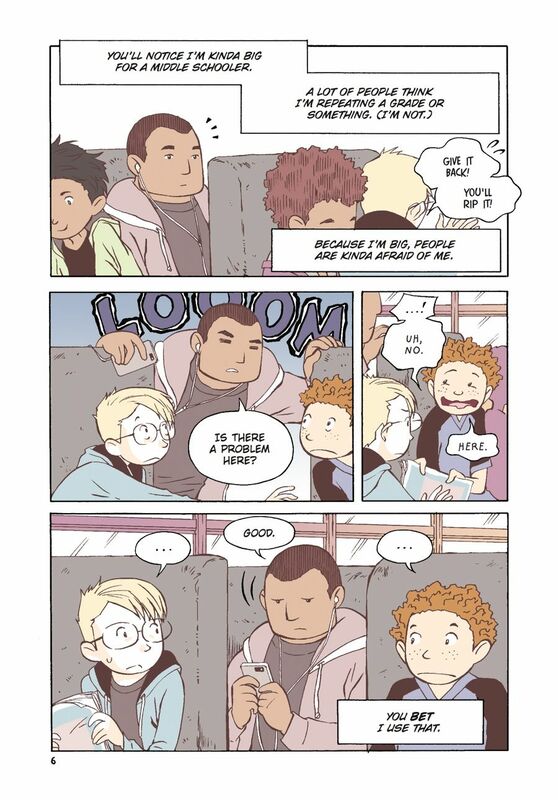 Second, this book is quite sweet in how it captures the tenor of a young person's developing a crush on someone. Jorge realizes after a while that he has feelings for Jazmine, a young woman in the drama club. She's got a boyfriend though, and he has always taken solace in having two strong lifelong friends Liv and Garrett, but he struggles with the changing dynamics among all their relationships. Her has always been a solid citizen and depending on a certain level of consistency, but he finds that life is taking some interesting curves and he's not sure he is comfortable with the whole enterprise. Even though my years in junior high were long ago, I could definitely relate to many of the feelings Jorge has to deal with here. Third, the storytelling in this book is excellent. The characters are well designed in terms of their roles and their visuals. The action is compelling, and the gags pay off well. The situations they deal with seem very authentic and contemporary, with real stakes. And perhaps best of all, the book does not require the reader to have read any of the others. Each entry in the series stands alone and is rewarding on its own merits. At the same, knowledgeable readers will enjoy seeing certain characters pop up again, making this a book that plays well to a large audience. This is a fun, moving book, much like the other books in this series. I would certainly expect them to be a staple in school or class libraries. This book's creator Svetlana Chmakova is a celebrated comics artist who has won a slew of awards and accolades for her works. In addition to the Berrybrook Middle School series, she also has published Dramacon, set at a comics convention, and the supernatural themed series Nightschool. She speaks about her work on Crush in this interview. All of the reviews I have read about this book were glowing. 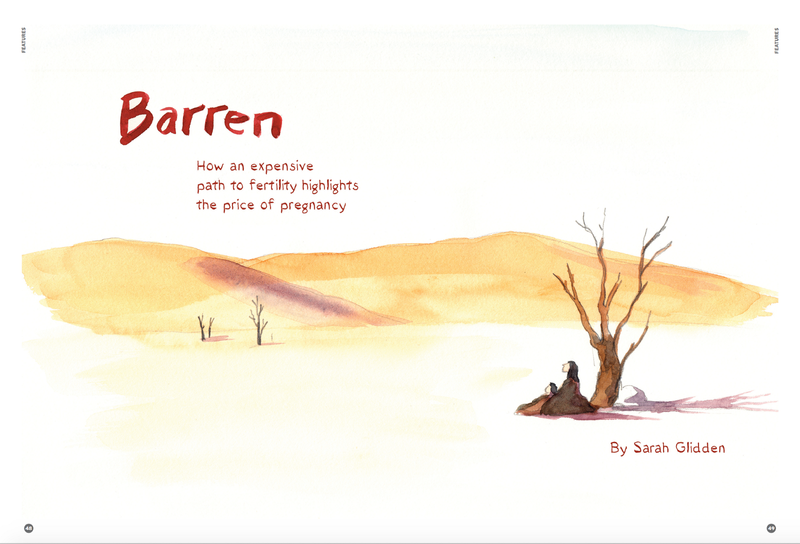 Esther Keller at School Library Journal called it "a must have—and one of our picks for the top ten graphic novels of 2018!" Carrie McClain summed it up as "an adventure for the tween/preteen age group that carries all the feels and makes the ordinary seem extraordinary by how relatable it is." Sarah concluded her review, "I love the manga stylings of Chmakova. I love her diverse cast of characters and her socially conscious narratives, which support the growth of young girls. I know this one isn’t technically out yet, I know that the author just had a baby, but GAAHHH I want more!!" Crush was published by Yen Press, and they provide more info about it here. 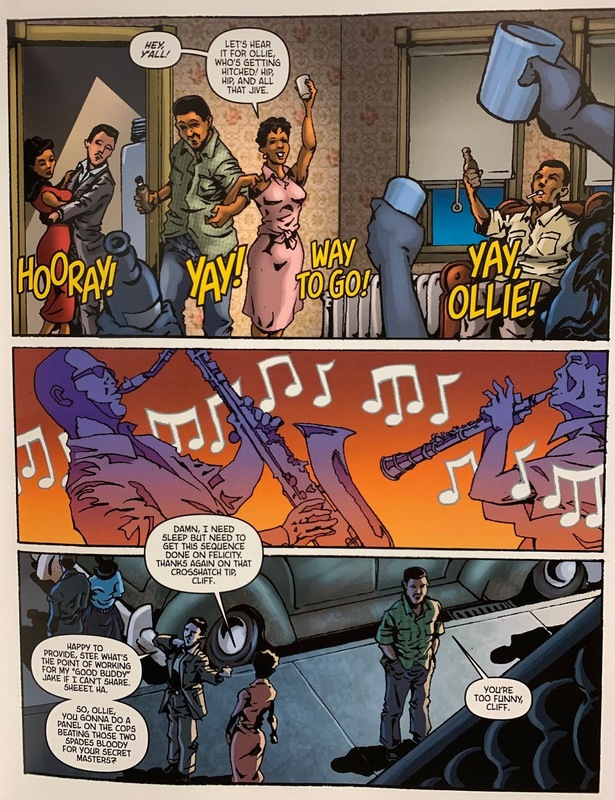 The Be-Bop Barbarians is a fascinating, gripping look at life in the 1950s for three African-American artists living in New York City. They are fictional figures, though they are based on real people, according to the book's introduction. 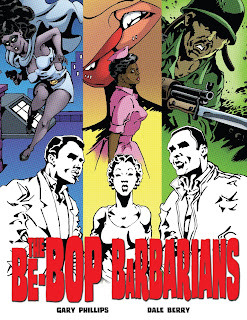 The protagonists are Cliff, a light-skinned handsome man who passes for white in certain circles and who draws comic books (based on Matt Baker), Stef, who moonlights as a maid and domestic servant while drawing a romance comic strip for a black newspaper (based on Jackie Ormes), and Ollie, a veteran of the Korean War who publishes political cartoons under a pseudonym (based on Oliver Harrington). 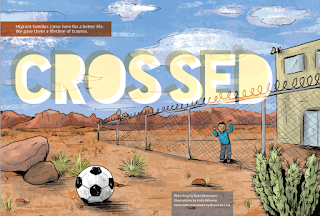 The three friends and colleagues are involved in civil rights issues that affect their daily lives. Cliff struggles to maintain various identities (and romances) as he works and travels about town. Also, he is on the losing end of a legal struggle with a publisher who is trying to steal the rights to a character he created. Stef struggles to make ends meet and also is conflicted by some of the racist attitudes she faces from those she works for. Ollie is married to a Korean woman, and while they await the birth of a child, they face harassment on numerous fronts. All three chronicle the disturbances, slights, and inequities they experience through their art, transforming them into something politic and motivational. Their bravery and creativity wins the day even though they face numerous obstacles and prejudices. A book like this, woven from masked historical figures, runs a danger of reading like straight propaganda or being related in ham-fisted manner, but The Be-Bop Barbarians is a vivid and vital account of the hardships and unjust social realities of the day. The various plots are compelling, the characters strong and nuanced, and overall the book is an excellent piece of historical fiction. It made me care about the characters and also learn about the times the story was set. I was also impressed by how they wove together the three different tales into a cohesive, moving whole. Also on the positive side, I appreciated how this book introduces a new generation of readers to some important, often forgotten, comics artists from the past. 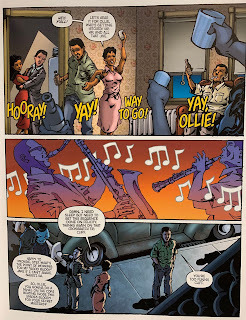 This book was a collaboration between writer Gary Phillips and artist Dale Berry. Phillips has penned several novels and has multiple and diverse credits in comics, including editing the conspiracy/noir collection The Obama Inheritance and co-writing the neo-noir/punk series Peepland, which was set in the 1980s. There is a six-page sequence in this book that features his prose without the illustrations, and I felt it was an effective narrative device. 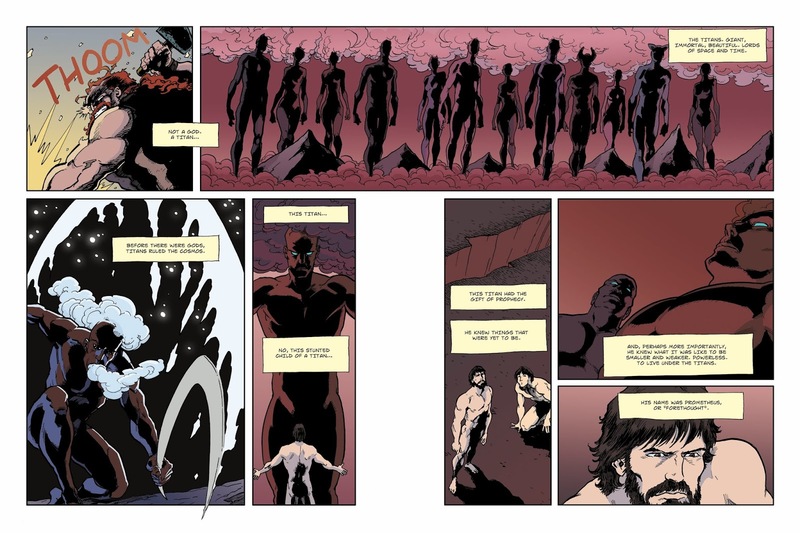 Berry has been drawing and creating comics since the 1980s, and he created the first graphic short story published in Alfred Hitchcock's Mystery Magazine's 60 year history. I very much liked his storytelling and how he altered his art style to (re)create the look and feel of the disparate art styles of the three fictional creators. I was not able to locate many reviews of this book, but Molly Odintz called it "beautiful and moody, channelling the quiet desperation, simmering anger, and creative intensity of 1950s noir." The Be-Bop Barbarians was published by Pegasus Books, and they offer more info about it here.